Saudi Arabia has become a land of opportunity with more than 2 million foreign workers, one in six of the population. Job openings attract people from Ireland, the UK, Europe, the USA, Australia and the Far East. Living & working in the Middle East is the experience of a lifetime, where you can make lifelong friends, travel the world and return home financially secure. Whether it’s career progression, travel opportunities or earning extra cash topping your agenda maybe you should think about nursing in the Middle East. Contact CCM for more information. Want first hand insight into what it’s like being a nurse in Saudi Arabia. 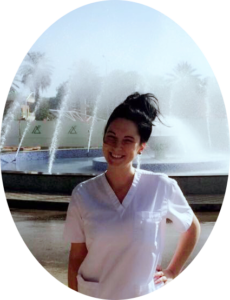 Check out our Q & A with Rebecca Fisher who has worked in Saudi Arabia for 2 years. 1 – Where are you from? 2 – Where were you trained? 3 – Where have you worked before? I qualified in 2012, and started working in a Derry Hospital on a plastic + orthopedic ward. I then moved to the UK for a time and worked again in orthopedics. Following this, I returned to Ireland and immediately applied for the Middle East via CCM. While I was waiting for my transfer to KFSH&RC I worked agency in various different departments. 4 – What previous types of jobs have you done? Mainly plastics and orthopedic, however during my time doing agency I worked in medical, surgical and mental health departments. 5 – When did you travel to the Middle East? 6 – Why did you choose this side of the world? I knew I wanted to go to the Middle East for the financial opportunities and it is also in the hub of everything for travelling. 7 – What made you make the change? I wanted to be as independent as possible, while also securing a future for myself. The Middle East was the perfect option to achieve my life goals. 8 – What is your current work status? 9 – Why did you choose KFSH&RC? I contacted CCM with the Middle East in mind and a job opportunity became available in KFSH&RC. 10 – Would you encourage others to make the change? Why? If you have a positive outlook on life and you are willing to adapt then absolutely, yes! KFSH&RC gives you every opportunity to grow and upskill, while also allowing you to secure a future back home. 11 – How have you managed the change in your life? I have managed very well and I have adapted to the way of life here. However, it is important to remember that it may not suit everyone as it has me. 12 – What challenges have you faced to date? Why? How? I have faced very few challenges and always tend to maintain a positive outlook on life. This has helped me greatly, because negativity draws negativity and when you’re away from home and your usual circumstances, people can focus only on the aspects of the Middle East that they don’t like. 13 – Could you comment on the positives that you have found to date and perhaps some of the difficulties? The independence of living my own life in the way I want to live it. I can book a holiday to an exotic location on a whim with friends and this is the greatest benefit. I have travelled to places that I would never have seen if I stayed back home. The shift work is great also because you can be on team A or team B, my friends have requested to work on the same team as me and this allows us to plan for future outings and holidays. Every second weekend is a three-day weekend off and this was not something I could do at home. My shift pattern at home was very sporadic and I didn’t have future roster available to me. In Saudi, I have a set shift pattern that repeats itself so you can plan events/trips well in advance. Obviously, the financial gain, which has exceeded my expectations is a huge benefit. I am in a position where I can have the luxuries in life while also saving. There are no true negatives, but it’s not a walk in the park either, work can be demanding as it is anywhere in the world. 14 – What career opportunities have you found here compared to back home? There is an educational center on site and via an internal intranet you can book onto pretty much any course. Most of these courses are free to attend and are certified by KFSH&RC. For instance, on unit level, we have been given the opportunity to upskill and do a chemotherapy administration course. Courses such as this will forever expand my skill set. 15 – What have you found to be your most memorable moment since arriving? When I completed my 1st year and re-contracted for the 2nd year I was so pleased with myself and proud of my achievements and savings. 16 – How do you spend your leisure time? There is a pool and gym in each complex so days off are leisurely, the sun shines all year round! I have made fantastic friends here (mainly from orientation) and we do movie nights (there’s a cinema screening every Thursday in the Hospital), take out nights (Hungerstation! ), trips to the malls and attend embassy nights out/balls/events which are my favorite! 17 – How do you keep busy? To be honest, I love NOT being busy! I can go a week without having to leave my complex and its bliss, I have no responsibilities here. I can do what I want, when I want and be as busy as I want myself to be. 18 – How would you compare the price of things to back home? It’s much the same, I have found that the clothes are slightly more expensive than the shops at home (like H&M, New Look, River Island, Topshop) but I’m sure that all depends on the exchange rate on the day. 19 – Culturally how have you found it? I mean it’s a totally different culture, but I came with an open mind and that hasn’t changed. I would not like to be judged for my choices and so I don’t judge others for theirs. The Saudi people are really nice and very generous. They really are very giving people and they rarely complain. 20 – What is your overall opinion to date? I am so glad I came, that I stuck out the 90 days (probation period) and I feel I have blended well into my work and lifestyle. It really is your personal outlook on the situation – you can have an amazing experience here if you want it. I think people have a pre-conceived idea of what Saudi is like, but I can assure you it’s very different! Connect with us on social media to get the latest info, job vacancies, interview and workshop dates. We update our social media every day so by becoming a fan on Facebook, Instagram or following our tweets you can make sure that you hear the latest things first.